U.S. Secretary of State Rex Tillerson, left, is welcomed by Britain's Foreign Secretary Boris Johnson in London, Jan. 22, 2018. The United States is expressing concern about Turkey’s offensive in northern Syria and top officials are appealing for restraint and fears that the conflict could spread. 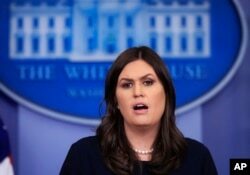 FILE - White House press secretary Sarah Huckabee Sanders talks to reporters during a press briefing in the Brady press briefing room at the White House, in Washington, Jan. 11, 2018. While Washington wants to preserve its relationship with Turkey. it also has ties to Kurdish and other forces forces targeted by Turkey. In a London press conference Monday, Secretary of State Rex Tillerson said “The U.S. is in Syria to defeat ISIS (the so-called Islamic State), and we’ve done that with a coalition of partners, and the Syrian Democratic Forces in particular, which are comprised of Kurdish and Arab, but also elements of Christian forces. It is truly a multiethnic group of fighters who are defending their home territory. And so we are concerned about the Turkish incident in northern Syria." Later, Tillerson downplayed concerns about rising tensions between Turkey and the United States. “I don't think you’re going to find two NATO allies facing off at all,” he said. U.S. Central Command spokesman Lt. Col. Earl Brown told VOA the U.S. has no coalition operations in Afrin. He also said the U.S. has a MOU (memorandum of understanding) with Turkey where they let the U.S. know of operations in Syria and they have kept to that memorandum. 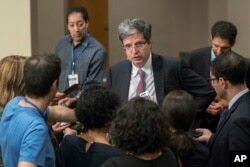 FILE - French Ambassador Francois Delattre speaks to reporters as he arrives for a Security Council meeting, July 24, 2017, at U.N. headquarters. On Tuesday, Tillerson will meet with senior French officials to discuss a range of issues, including Syria, Iran, Lebanon, Libya, the threat from North Korea, and Ukraine. He will also attend the launch of the International Partnership against Impunity for Use of Chemical Weapons. State Department officials say Tillerson is set to make remarks in Paris on Syria and chemical weapons. Tillerson told reporters he would have an exchange of views on stopping the use of chemical weapons. “Obviously, we know chemical weapons are being used in Syria. We've seen it,” he said. “Civilians are being killed and it is not acceptable,” he said. U.N. to address use of chemical weapons? Goldstein added that Russia needs to do more to stop the killings.